For U.S. Government Gang Stalking Continuing. Police, Firemen, EMS, Ambulance Drivers, Security Guards, Neighborhood Watch Group Members Have Been Gang Stalking/MOBBING Ordinary Citizens For Over A Decade. Copy and Paste the Following 13 Links And Send Them To Everyone You Know To Help Expose America's Gang Stalking Stasi. For A Lifetime of Gang Stalking. Are we seriously continuing the Fascist Program of U.S. Government Gang Stalking because we don't want to alienate our Intel Agencies? Get a backbone, American Political Leaders. Time To Restore the Constitution! Tyranny: "arbitrary or unrestrained exercise of power"
U.S. Government Gang Stalking Is Tyranny. Ask Kevin McCarthy, Mitch McConnell, Chuck Schumer, Nancy Pelosi why they are allowing U.S. Government Gang Stalking To Continue. Ask Them: How is it since Bush/CHENEY Citizens in the United States are now Gang Stalked For Life? Why isn't Congress Stopping COINTELPRO-like programs by our Intel Agencies that abuse the rights of citizens? Government Gang Stalking is not a fluke in an otherwise normal government. It's the canary in the coal mine indicating we no longer have a Government based on The Rule of Law/Constitution. Listen to What This Former FBI Senior Intelligence Adviser said openly on CNN. Government Gang Stalking has gone on for, at least, 12 years and it continues today, because there is nothing to gain for either our two power centers - the Democratic and Republican Parties - to expose it. That's why we will never Restore Government of , by, and for the people, without legislation encouraging and protecting Whistleblowers in Every Nook And Cranny of Government. Don't hold your breath, however, waiting for Congress to do that, because they know that having whistleblowers exposing the truth might interfere with the Phony Balony Narratives they use to get elected. In a country with a Gang Stalking Stasi, we must demand every member of Congress, as well as, candidates running for Congress, put forth a plan addressing the issue of the lack of Accountability of our Intelligence Agencies in the United States. Government Gang Stalking is An Indictment of American Institutions - Our Government which put into effect this abomination, Our Press which allows it to go on, Our Schools which turn out these Herd Animals/The Government Gang Stalkers, and even some of Our Churches many of whose members participate in it on Church property. On Feb. 24, 2018 I went to retrieve a UPS package and a RED car came in front of me as I opened my front door. Now today on Feb. 26, 2018 I went to retrieve a UPS package and a RED car is pulling into a driveway again. I notice such things because since May 2006 I have been Gang Stalked by First Responders and people wearing or carrying RED or driving RED cars or trucks. Now, of course, this could be a coincidence, but in my over a decade experience as a U.S. Government Gang Stalking Target one of the Tactics used conforms to this pattern called Same Time Exit/Entry in Gang Stalking. 1. Does the U.S. Government Gang Stalk citizens using First Responders and Neighborhood Watch Groups? 2. Do they get neighbors/people in the Neighborhood to Gang Stalk a target on their entries and exits? 3. Do they predominantly use RED cars, RED trucks, wearing RED in Gang Stalking? 4. Do they read your emails - for instance, notification a UPS package is coming, and use that information for U.S. Government Gang Stalking? 5. Are targets tracked in their own home? Thus, do they know when targets get up and check on a UPS package? Do they use that information to Gang Stalk? After nearly 12 years of experience I contend our Intel Agencies who Gang Stalk are grossly Narcissistic and Sociopathic repeating patterns of their PSY-OPS program against citizens, U.S. Government Gang Stalking, 24/7. They are sure they have nothing to fear from my videos and snapshots. They are sure neither Congress nor the President nor the Media will ever reveal that today – since Bush/CHENEY – since Attorney General Michael Mukasey changed the FBI Guidelines opening the way for innocent people to be surveilled without end for their lifetimes with no evidence of cause of wrongdoing – a percentage of our population Gang Stalks. We, the American people, must be equally sure that the effort to expose U.S. Government Gang Stalking, a Stasi-like program, will never end, because Tyranny Must Always Be Met With Resistance. Tell Congress We Need A Special Counsel To Investigate The FBI's and DOJ's Surveillance of Citizens on Bogus Evidence. Their Crimes Go Way Beyond The Surveillance of Carter Page. 2. What criteria is used by our intelligence agencies to surveill citizens? 3. How many intelligence agencies and private contractors are involved in the surveillance of citizens? 4. What recourse do citizens have who believe they are being surveilled unfairly/illegally? 5. What methods are being used to surveill citizens? Do they comport with the Constitution? 6. How long are individual citizens being surveilled? 7. Is oversight of our intelligence agencies and private contractors sufficient to avoid violation of the Civil Liberties of citizens in the area of surveillance? I believe it was asking these questions on Facebook that resulted in the disabling of my Facebook account. 2/7/2018 Facebook has restored my account. This is pretty much their pattern of harassing me to discourage my exposing Government Gang Stalking. They do things like this all the time. The Washington Post in an Investigative Series entitled Top Secret America revealed Top Secret America is so vast - no one knows what it is doing. We have reached a pregnant moment, when with sufficient pressure by the American public and press, a Special Counsel might be appointed to find out what our intelligence agencies and private contractors are doing to citizens in the area of surveillance in the name of the American People. To the Democrats Who Are Now In Bed With Deep State: It was not too long ago when our Intelligence Agencies were spying on Congress and lying about it - that YOU called them "Criminal." Shame On Your Putting Political Advantage Above The Constitution! Until we have Multiple Political Parties instead of just two Corporate Parties that don't represent us, until "See Something, Say Something" is aimed at the government itself, with legislation encouraging Whistleblowers in every nook and cranny of government - it is up to us to Expose Corruption like U.S. Government Gang Stalking. "Mobbing is a form of persecution, of humiliation, of degradation. It is the dark side of organizational life in workplaces, universities, schools, religious organizations, the military, the judicial system, correctional institutions, and community organizations like condominium and homeowners' associations." "A reasonable person might be forgiven for thinking that this kind of thing couldn't possibly happen today, in the 21st century. BUT IT DOES AND FREQUENTLY." It’s A Sick Dysfunctional Society. Want To Create A Dysfunctional Society? Stoke People's Fear. Stoke People's Anger. In a Sane Society There Are Evidence-based Arguments/Transparency. Distorted By Fear and Anger/Secrecy. who pretend U.S. Government Gang Stalking Doesn't Exist? How do you explain U.S. Government Gang Stalking to someone who has no knowledge that their Government is engaged in the psychological torture of citizens, that a fourth branch of government has grown up - call it Deep State, the Intelligence-Industrial Complex - vast, horrific, engaged in unbelievable activities that don't belong in any civilized society, no less a democratic one. I take pictures and videos of the U.S. Government Gang Stalking I have experienced since May 2006 when a conflict with a fireman neighbor initiated my over a decade nightmare. You will find them spread throughout my website. I have included links to articles to help you to understand what is going on. The best description of this cancerous program is contained in this link - http://truedemocracy.net/hj36/04.html. The only parts of this article I have no knowledge of is when it talks about electronic harassment - which I associate with government disinformation - sexual assault, and break-ins to the homes of targets. The article right after this article seems to me to be pure government disinformation. But that's what you will find on the Web - real information buried amidst tons of Government Disinformation. The Best Description of the Criminality of Deep State, the Crimes of Our Intelligence-Industrial Complex, I have found on the web is at this website - http://www.fightgangstalking.com. The Best Book Detailing the Level of Threat We Are Under Which Requires The Action of All of Us is Mass Surveillance and State Control by Elliot D. Cohen. The American people are alone in confronting this. Our bought and paid for government - including the Intelligence Committees in Congress who are suppose to provide oversight of our Intelligence-Industrial Complex - are doing nothing to help. What you can do is Copy and Paste this link - http://stopgangstalkingpolice.com/copypastethispage.html - to help spread the word about what is going on. To Help Stop Government Gang Stalking - 202-224-5972. Click this sentence for suggestions on how to explain Government Gang Stalking to members of Congress. "A 5 Page Description of My Government Gang Stalking"
is now available to be purchased for $.99 at Amazon.com. It was called Zersetzung by the East German Secret Police who used this psychological technique against political opponents. How Does The Corrupt U.S. Government Create New Anchors In U.S. Government Gang Stalking? Click This Sentence To Find Out. In Voting I see the candidate the Gang Stalking Police back and then vote for their opponent. Read the script for the above video by clicking this link. Click here to read the text of What's Wrong With U.S. Government Gang Stalkers. Click this sentence to read the text of the above video. Click this sentence to see patterns in U.S. Government Gang Stalking I have seen every day, 24/7, FOR THE LAST NINE YEARS. U.S. Government Gang Stalking Hurts National Security. It focuses the attention of First Responders and the National Neighborhood Watch Group Program/Citizen Corps on People Who Have Done Nothing Wrong Except Be Victimized By Bad Cops and Bad Firemen Using Suspicious Activity Reports To Execute Personal Vendettas, often with the Help of Mobbing Friends (Nurses are notorious for this - as MOBBING is rampant in Nursing). It fills databases with the names of people targeted in Personal Vendettas. The U.S. Government must create a way for Citizens To Bring Complaints Which Will Be Investigated Against Bad Cops and Bad Firemen Who Use Suspicious Activity Reports in Personal Vendettas. WHAT Bad Cops and Bad Firemen are doing in using Suspicious Activity Reports in Personal Vendettas MUST BE MADE A CRIME. ACLU: A bloated, opaque watchlisting system is neither fair nor effective. A system in which innocent people languish on blacklists indefinitely, with their rights curtailed and their names sullied, is at odds with our Constitution and values. On Dec. 3, 2015 Morning Joe asked Congressman Mac Thornberry why people on Watch Lists should not be prevented from having guns. Congressman Thornberry of Texas replied: "In the past few days I personally have heard of police, sheriffs, a variety of people who are on Terrorist Watch Lists, so what happens is we dump a bunch of names onto this list for a variety of reasons (including personal vendettas by bad cops and bad firemen), and then we want to infringe (I would say Government Gang Stalking 24/7 FOR YEARS is a tad more than just infringing) on 2nd amendment rights just because of some administrative error (and the gross incompetence of investigators okaying names on these lists) AND SO MAYBE IT COULD BE TIGHTENED UP MAYBE YOU COULD HAVE A DIFFERENT SORT OF LISTS THAT WOULD MAKE SOME SENSE, I AM OPEN TO PURSUING THAT." Here you have a member of Congress, Representative Mac Thornberry, acknowledging to Morning Joe - Our Watch Lists Are Filled With Inaccuracies and if we would want to use them to keep guns away from terrorists - WE WOULD NEED A DIFFERENT SORT OF LIST. OUR WATCH LISTS ARE BOGUS - EVEN MEMBERS OF CONGRESS KNOW IT AND THE IDEA WE WOULD GANG STALK AVERAGE CITIZENS WITH BOGUS LISTS IS BEYOND OUTRAGEOUS. IT'S TIME TO TAKE THE NAMES OF INNOCENT PEOPLE LIKE ME - A THIRD GRADE TEACHER FOR 29 YEARS - OFF OUR BOGUS WATCH LISTS AND TO INVESTIGATE GOVERNMENT GANG STALKING FOR YEARS AGAINST TOTALLY BLAMELESS PEOPLE. "There is considerable anecdotal evidence that the suspicious activity reporting system is being “gamed” for personal benefit (personal vendettas, etc.). This has also been true in other informant cultures, as the following quote illustrates. Click this sentence to see more videos from my walk in Carlsbad on Nov. 11, 2015. Government Gang Stalking is a PSY-OPS program. Its core is the Neuro-Linguistic Programming Technique of Anchoring. In response to my posts on Facebook a Neuro-Linguistic Programming Workshop Leader told me - now I understand why Firemen (who are among those Gang Stalking Citizens) were signing up in such great numbers for NLP Workshops. The Primary Anchor used in Government Gang Stalking from its inception to May 29, 2015 was RED (Red cars, RED trucks, or Gang Stalkers who wore or carried RED). Then on May 29, 2015 with thousands of people knowing RED was the primary Anchor used in Government Gang Stalking, they started intermittently using RED, but Primarily using Black (Black cars/trucks/people wearing Black shorts, pants or shirts, pushing Black strollers, riding Black bikes). When an Anchor becomes increasingly known by wide segments of the population, the Government simply adds another, to facilitate Gang Stalking operating without detection. After 9 years of exclusively using RED Anchors, when I had hundreds of thousands of views on my you tube channel, one by one, they added Black, White, Blue, Yellow and Green Anchors. Today RED is the primary Anchor used, Green the second most used Anchor, and Yellow is only sometimes used. There was something very similar to Government Gang Stalking that occurred in America - The American Protective League. It appears the Bush/CHENEY Administration took as its models in starting Government Gang Stalking both the American Protective League and the Stasi in East Germany. Government's PSY-OPS Program against citizens - Mobbing. was written by Maureen Duffy and Len Sperry. I think it is obvious from the story of Reidar Visser that the Right Wing Authoritarian Crazies who once pulled off things like COINTELPRO and the McCarthy Era are now in charge of a World Shadow Government (no doubt somehow related to NATO). Reidar is naive to complain that he has broken no law. These Lawless freaks don't give a damn about the Rule of Law. What we are seeing is a Totalitarian World Government in the making. This is all about creating Fear in the public, not in any way about the Rule of Law. Here's an Explanation of Government Gang Stalking that even the Stupid Gang Stalkers of Oceanside and Carlsbad might understand: Those in power have figured out that they can't jail or kill all the opposition that might arise from those they are screwing, so they have come up with an alternative to jailing, killing those who might oppose their Corrupt Values - psychological torture. Government Gang Stalking has the elegance of keeping the "unwashed mob" under control through Fear when the opposition to your Greedy, Selfish Goals are too many to jail or kill. Click this link to see video of Gang Stalking by the Carlsbad Police the night after I received a death threat - 11/28/2014. AN AMERICAN OUTRAGE! 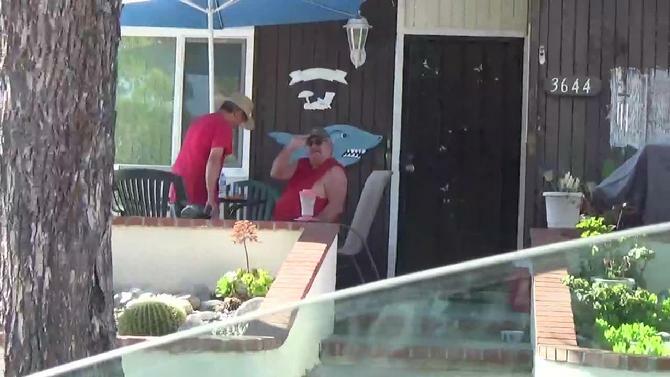 Firemen Gang Stalking Citizens 24/7 for years - The Tactic the Carlsbad Firemen are using here is Same Time Exit/Entry - the premier Government Gang Stalking Tactic. Here we're Gang Stalked as we walk by the beach. Click this sentence for more videos from the same night - Oct. 4, 2014. Government Gang Stalking is a wake-up call that at our local level mechanisms of Police Accountability do not exist. We need to demand that police must wear cameras they cannot control. We need Civilian Police Review Boards in every community. We need to start aligning ourselves with Groups like the National Police Accountability Project to restore the Rule of Law to our communities after the reign of terror/Gang Stalking we've seen under Bush/Obama. What is the Role of Law Enforcement Intelligence Units in Government Gang Stalking? I am being Gang Stalked by firemen, ambulance drivers, as well as many people living in the Wedgewood development in the Town of Newburgh. David Lawson, who has done research on gang stalking said, firemen are consistently found to be gang stalkers. An investigator with the Orange County District Attorney’s office told me policemen and union members also engage in gang stalking. Mayor Valentine of the city of Newburgh told me he frequently gets complaints about gang stalking. I have enclosed some pictures of my gang stalking. Gang Stalking starts with a conflict with one individual, in my case, with the fireman XXXXXXXXX. He comes from the city as do my neighbors XXXXXXXXXXXXXXX. James Tedisco, the Assembly Republican Leader, wrote me that crimes traditionally found in cities are now moving into rural areas. I have been to the town police and the state police and no one has been able to help me with the gang that has harassed me and stalked me since the summer of 2006. I have had graffiti put on my house, the handles on my mailbox slashed, the handle on my garbage can cut, pails, a tree, a table, leaves and other things dumped on my property, my car scratched, pieces of fence stolen, dead animals dumped on my property, been subjected to constant noise. But the worst part of the gang stalking is the constant harassment. The people who XXXXXXXXX. In Same Time Exit/Entry when I go out or come home – they have one of them either pull out of their driveway or just drive up. So many people participate in the gang stalking, I believe, because they recognize the power of all the firemen who are involved with it and are afraid of being stalked and harassed themselves. In gang stalking they try to show that the target is mentally unstable. Twice the Orange County Department of Social Services were sent to my home. The first time the caller said among other things to Social Services that I call the police on my neighbors XXXXXXXX. The second time they came the social worker told me the caller said he was afraid I was unable to take care of myself. This started out with just the fireman XXXXXXXX. Then in the summer of 2006 the people XXXXXXXX– using Same Time/Exit Entry, beeping or making noise when I went in my yard. There was beeping or siren sounds when I came home or went out. When I went to put out my garbage there might be a car with headlights shining at me up or down the street. Even when I went to walk my brother (who has Down Syndrome) in the park at Cornwall or in the park in Poughkeepsie or in New Windsor there would be siren sounds. I take my brother walking to the same places in Cornwall, Newburgh, and Poughkeepsie and I believe my routines have been ascertained so that harassment follows me where I go. When I would go out onto Route 32 there would be a volunteer fireman going by with flashing lights, fire department SUVs, once even a fire truck on Gail Place doing Same Time Exit/ Entry – the tactic the people XXXXX. My strategy in dealing with the harassment and stalking has been to make it public. I would post what the Gang Stalkers do on signs in front of my home. There are no laws against gang stalking. This was the only way I could think to defend myself against the constant harassment. The Town told me to take the signs down which I did. The state trooper, Trooper Conboy, who investigated the graffit on my home told me he thought it was a hate crime and told me to call the FBI. I did and they said they are not responsible for hate crimes and they didn’t think the gang stalking I was experiencing was a hate crime. I am writing to you because from my conversations with Mayor Valentine and the investigator in the Orange County District Attorney’s office I know I am not alone in having been the target of gang stalking. From my research I learned single woman are often the target of gang stalking. The scary part about this is you can have a conflict XXXX, he can call on firemen in surrounding towns and launch a campaign of constant harassment and stalking against you using sirens, fire vehicles, and many individuals who make up these gang stalking squads, and there is nothing the target can do about it. Even when I publicize what they do they just stop what I publicize and switch to something else. So when I put in letters on my back bedroom window the house number of the gang stalking ringleader with the words – Siren on Exit/Entry – suddenly all the siren sounds stopped – but then the stalking by firemen began. When I pointed my camcorder at them, they just stopped doing that and started Same Time Exit/Entry again with the ringleader’s friends. There is no way to stop the constant harassment of gang stalking. Hence I am asking your help. I am asking you to make the people who trigger the gang stalking of targets such as myself – XXXXXXX– guilty of a hate crime. As it stand now if someone burns a cross on your lawn and you fit the category of targets of hate crimes the perpetrator can be prosecuted for a hate crime – but if you like my XXXXXXX get 10 or 20 or 30 or more people to constantly harass and stalk a target for years law enforcement lets it go on. It is especially vicious if you are a fireman and can get firemen from other towns to join in. I know it is impossible to hold all the people who participate in gang stalking responsible – but the ringleader, the person who gets other people to gang stalk a target SHOULD BE GUILTY OF A HATE CRIME. Since the ringleader of my gang stalking is a fireman there is no guarantee that even if I move to another state my life will ever be free of gang stalking. I ask your help to please make sure this never happens to another person – please make the person who gets others to gang stalk a target guilty of a hate crime. I believe this has to be done at the federal level because with firemen the gang stalking does not always stop at the state line. If there is anything you can do to help my individual gang stalking, I would be very appreciative. Beside making the person who organizes the gang stalking of a target a hate crime, another thing, I think, that needs to be done is to formulate codes of ethics for firemen, policemen, ambulance drivers including volunteers that prohibits them from using sirens, vehicles for harassment and stalking with penalties for violations. Thank you for your help and attention. Our Police Have Become The Personal Security Force For THE 1%. 1. Pattern: The Gang Stalking starts the minute I leave my house. I am Gang Stalked on my street with a Tactic Called Same Time Exit/Entry and/or at the End of My Street and/or as I exit my development via Buena Hills and/or at the Vista Way/Buena Hills intersections EVERY DAY FOR YEARS. I would like to stress I am not saying this person is a Gang Stalker. I'm not a mind reader. I don't know people's intentions. In all my videos I just try to show patterns in Government Gang Stalking I have seen every day for the last seven years. 3. Pattern: Here just before the Intersection of Vista Way and Via Esmarca you see a person in RED. The important thing in Government Gang Stalking is ANCHORING. People wearing RED are at the target's exits and entries - all along her route. These are our Neighborhood Watch Group members who Bush/Obama have turned into an American Stasi. 4. Gang Stalking behavior differs from ordinary behavior because of its repetition and duration. Like clockwork - I will see a RED car in the exact same place you see this one every day as I come to this intersection. 6. This is the first time of 3 Carlsbad, CA police Gang Stalking me as I get out of my car for my walk with my handicapped brother today. Police, Firemen, EMS, Ambulance Drivers, Security Guards all Gang Stalk in Bush/Obama's STASI GOVERNMENT GANG STALKING AMERICA. They especially Gang Stalk at entries and exits. 7. This is typically what happens in Government Gang Stalking. First a Carlsbad Police Gang Stalks me as I get out of my car for my walk. Then a biker in RED comes by. There is one after another of Gang Stalking in succession throughout my day, every day - going on seven years now. 8. As I get out of my car to go for our walk on 11/24, 2013 one after another of Carlsbad, CA's GANG STALKING POLICE goes by/stalks. The ACLU tells us illegal police surveillance is going on in over 30 states. You can thank Dianne Feinstein and Mike Rogers who are responsible for oversight of our intelligence-industrial complex for what is going on. 9. Here we are going home and there is a RED car first in line at the intersection, but this is a pattern I saw all along our walk today and that I see everyday. 10. As we walked along Carlsbad Village Drive on our walk today a GANG STALKING CARLSBAD Fire Engine passed in front of us as we were about to cross the street and here as we are on our way home, they GANG STALK again. When I lived in New York I was daily Gang Stalked by Fire Chiefs in the Fire Chief SUV’s from all surrounding districts and by Firemen from all surrounding districts in their Fire Engines. Here in California I am Gang Stalked by Firemen in their Fire Engines and by EMS. My videos capture a fraction of the Government Gang Stalking I am subjected to each day. It is impossible to capture it all. THEY ARE USING NEIGHBORHOOD WATCH GROUP MEMBERS, so this goes on in almost every neighborhood. I would like to emphasize again, I never say individuals are Gang Stalkers. I am not a mind reader. I do not know people's intentions. I just show patterns I have seen every day in my seven years of being a Government Gang Stalking target. And that is what distinguishes Gang Stalking behavior from ordinary behavior. Ordinary behavior is random. Gang Stalking behavior is repetitive and endures. Look at my videos and you can see the patterns. 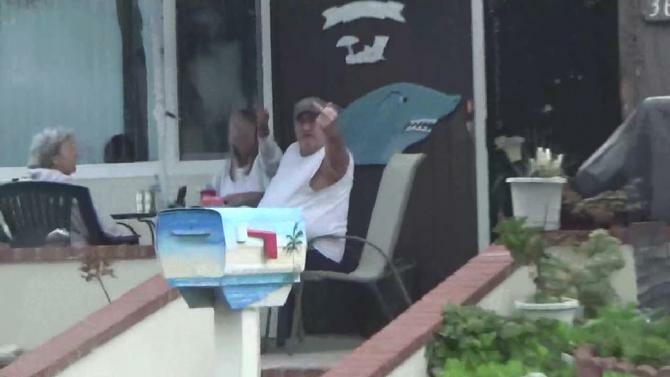 10/18/2013 - In the video below you see what goes on all day long in the life of Ordinary American Citizens targeted by our sick, corrupt Government in their outrageous Government Gang Stalking Program. Click this link to see patterns in U.S. Government Gang Stalking, our Government's New COINTELPRO-like Program, from my walk on Oct. 18, 2013 which uses First Responders and Citizen Vigilantes (our Neighborhood Watch Groups?) to UNREMITTING HARASS/SURVEILL Ordinary Citizens 24/7 FOR YEARS. Oct. 4, 2013 Gang Stalking at corners is a favorite tactic of The American Stasi/Government Gang Stalkers. In the video below you see how it is done. As we walk to the corner - a Gang Stalking Police SUV passes in front of us. 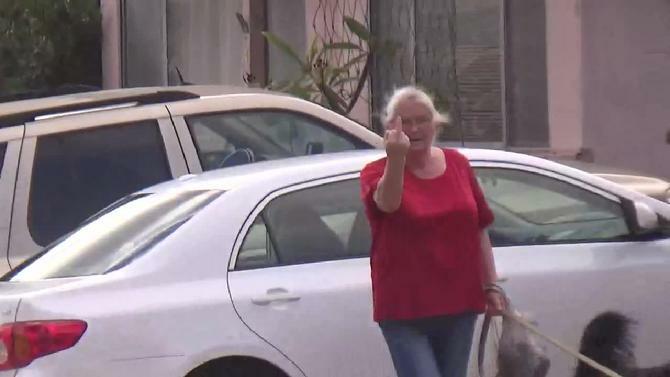 This goes on all during our walk with First Responders or Citizen Vigilantes (probably our Neighborhood Watch Groups) with their RED cars, RED trucks, and/or wearing or carrying RED, Gang Stalking at corners as we walk toward them or cross the street. Anchoring forms the core of Barack Obama's Government Gang Stalking Program. Click this link to see my walk on the South Strand on September 30, 2013 and how Anchoring works. 1. I'm going to Sprouts to pick up a couple of things before I go home (I have been gang stalked all day. I am posting daily accounts of my Gang Stalking since putting up this website under "Our Walks") when I reach the Chevron Station on El Camino Real there is a Carlsbad Police car coming from the road to my right. 2. As I turn left to go into Sprouts a Carlsbad Police car is one car ahead of me. 3. I get out of my car to go into Sprouts after parking in the lot. Now the Carlsbad Police Car is there in front of Sprouts. I cross in front of it to go into the store. 4. As I come out of Sprouts a Carlsbad Police Car is sitting in the lot. As I go to get into my car, it leaves the lot. 5. The car parked next to me pulls out - a RED car is parked next to the car that pulls out. 6. I pull out of my space and go to the end of the row. A different Carlsbad Police car passes in front of me there near Boston Market. 7. A RED car is parked at the end of the row. 8. Previously that day, as walked with my brother on Oak Avenue - with hardly no traffic - a Carlsbad Police Car drove down it. 9. As we walked on Pine Avenue approaching the corner of Pine and Harding - a Carlsbad Police Car passed in front of us. 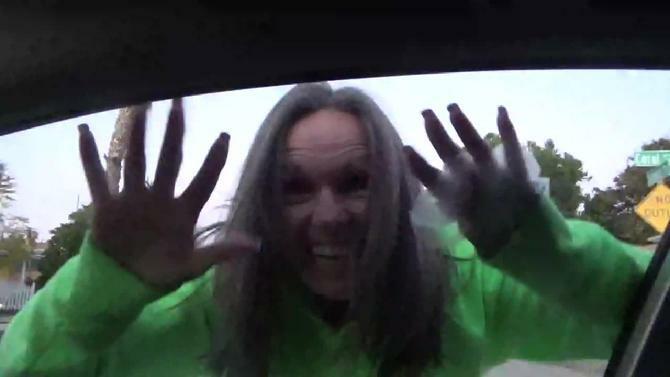 The Carlsbad Policewoman Pictured Above Holds The Record For Gang Stalking Us The Most Times - 5 - Of Any Single Police In Carlsbad or Oceanside. To see the Gang Stalking Record Holder in Action Click This Sentence. July 23, 2013 Here the Gang Stalking Carlsbad Police pictured in the car above gets out of his patrol car. He lamely looks in an empty store window. He doesn't know what to do, because HE CAME HERE TO GANG STALK ME. Other than that he has nothing to do. Click this link to see his floundering. IT'S HAPPENING HERE IN OCEANSIDE AND CARLSBAD CALIFORNIA. 1. What techniques does the U.S. use when it tracks citizens? 2. How, when, and why can it track citizens with GPS? Konrad Lorenz was the first to describe the very primitive behavior we see in Government Gang Stalking - mobbing. But it is to Sigmund Freud in his book, Group Psychology and the Analysis of the Ego, that we must look to understand the ferocity, the hatred, the primitiveness that only targets of Government Gang Stalking ever get to see and experience. Being a member of a group, Freud said produces the group mind. Being a member of a group gives the individual a feeling of power which permits him to express instincts he might have been able to restrain had he not become a member of a group. Hence people who know the individuals who do Government Gang Stalking have no idea of the hatred they express when they become part of Obama's Stasi. The new character that a group shows that the individual doesn't is the absence of repression of unconscious instinctual impulses. The group acts without conscience, said Freud. "In a group every sentiment and act is contagious. Isolated he may be a cultivated individual; in a crowd, he is a barbarian - that is, a creature acting by instinct. The feelings of a group are always very simple and very exaggerated," said Freud. "It goes directly to extremes; if a suspicion is expressed, it is instantly changed into an incontrovertible certainty; a trace of antipathy is turned INTO FURIOUS HATRED." The only thing a group respects is force. "Groups have never thirsted after truth," said Freud. The behavior of groups is based on fantasy, not truth. Groups are dominated by feeling, not thought. This is the cancer Bush/Obama has unleashed on ordinary citizens.